1370 Washington Ave, Ste 302. Not all colors might be available on release date. We might contact you to change color if the color selected is not available. All our phones are brand new unless specified otherwise. Our phones are factory unlocked and come with all original accessories in original box. Our phones might come with International Charger. A free US adapter will be added to your order for free if needed. GSM / HSPA / LTE. GSM 850 / 900 / 1800 / 1900 - SIM 1 & SIM 2 (dual-SIM model only). HSDPA 800 / 850 / 900 / 1700(AWS) / 1900 / 2100. LTE band 1(2100), 2(1900), 3(1800), 4(1700/2100), 5(850), 6(900), 7(2600), 8(900), 9(1800), 12(700), 17(700), 18(800), 19(800), 20(800), 26(850), 28(700), 32(1500), 34(2000), 38(2600), 39(1900), 40(2300). HSPA 42.2/5.76 Mbps, LTE-A Cat21 1400/200 Mbps. 157.8 x 72.3 x 8.6 mm (6.21 x 2.85 x 0.34 in). 189 g (6.67 oz). Front/back glass & aluminum frame. Single SIM (Nano-SIM) or Hybrid Dual SIM (Nano-SIM, dual stand-by). IP68 dust/water resistant (up to 2m for 30 mins). AMOLED capacitive touchscreen, 16M colors. 6.39 inches, 100.2 cm. 1440 x 3120 pixels, 19.5:9 ratio (538 ppi density). Corning Gorilla Glass (unspecified version). DCI-P3 - HDR10 - EMUI 9.0. HiSilicon Kirin 980 (7 nm). Octa-core (2x2.6 GHz Cortex-A76 & 2x1.92 GHz Cortex-A76 & 4x1.8 GHz Cortex-A55). NM (Nano Memory), up to 256GB (uses SIM 2). 256 GB, 8 GB RAM or 128 GB, 6 GB RAM. 40 MP, f/1.8, 27mm (wide), 1/1.7", PDAF/Laser AF 20 MP, f/2.2, 16mm (ultrawide), 1/2.7", PDAF/Laser AF 8 MP, f/2.4, 80mm (telephoto), 1/4, 5x optical zoom, OIS, PDAF/Laser AF. Leica optics, dual-LED dual-tone flash, panorama, HDR. 24 MP, f/2.0, 26mm (wide). 32-bit/384kHz audio - Active noise cancellation with dedicated mic - Type-C to 3.5 mm headphone jack adapter. Wi-Fi 802.11 a/b/g/n/ac, dual-band, DLNA, Wi-Fi Direct, hotspot. 5.0, A2DP, aptX HD, LE. Yes, with dual-band A-GPS, GLONASS, BDS, GALILEO, QZSS. 3.1, Type-C 1.0 reversible connector, USB On-The-Go. Face ID, fingerprint (under display), accelerometer, gyro, proximity, barometer, compass. Fast battery charging 40W (70% in 30 min) - Qi wireless fast charging 15W - Reverse wireless charging - DivX/XviD/MP4/H. 265/WMV player - MP3/eAAC+/WMA/WAV/FLAC player - Document editor - Photo/video editor. Non-removable Li-Po 4200 mAh battery. Emerald Green, Midnight Blue, Twilight, Pink Gold, Black. Limitless human imaginationthats the inspiration for the HUAWEI Mate 20 Pro. The breakthroughs in technology will blur the lines between what you can dream and what you can do. Simple camera design concept to create an aesthetic signature. See through the window, explore the world. A forged masterpiece of 3D glass with smooth curves and seams that dissolve into the design. A streamlined symphony in the palm of your hand. A tribute to natures rich colours, HUAWEI Mate 20 Pro is available in four vibrant colours. Light reflects beautifully off the back of midnight blue and emerald green making the unique Hyper Optical Patterns glitter. A special glass texture which is non-slip and anti-fingerprint. Like all works of art, HUAWEI Mate 20 Pros lines and features are symmetrically in harmony. The World is Your Playground. Take your HUAWEI Mate 20 Pro for fun to the beach or through the rain. The IP68 rated water and dust resistance1 means no worry of taking spills, splashes, and dunks. Worlds 1st 7nm Mobile AI Chipset The industry-leading 7nm process technology of Kirin 980 generates direct performance upgrade of speed improvement and power efficiency. HUAWEI Mate 20 Pro is the Worlds first 1.4 Gbps3 LTE Cat. 21 smartphone which supports up to 1733 Mbps3 Wi-Fi download speeds. Enjoy rapid, seamless connectivity anytime, anywhere. By leveraging L1&L5 dual frequency simultaneously, HUAWEI Mate 20 Pro allows you to always find the destination with great accuracy even in city centres surrounded by skyscrapers or highway interchanges. The new Leica Triple Camera powered by AI reveals lifes drama, texture, colour and beauty in every photograph that will take your breath away. Designed for different scenarios, the 40 MP main RGB lens captures great details in everyday photos, while the 8 MP telephoto lens will focus on your distant shots and the whole new 20 MP Leica Ultra Wide Angle Lens is perfect for the landscape photos and macro shots. Capture details and surprises you couldnt before. The Leica Ultra Wide Angle Lens takes extreme close-up shots from 2.5 cm. Discover the world from a new perspective. We "Guarantee" that we will make our best efforts to make you 100% satisfied! Customer service is our highest priority. Our trained and experienced representatives will answer any questions you may have before, during or after you place your order. Sobeonline1 makes every effort to get your order out as soon as possible. Below is a link that explains how to confirm it. International Buyers - Please Note. Replacement We will send a product replacement after the authorized return has completed our receiving/inspection process. Please allow additional processing time after Holidays. Battery, charger, cords, straps, etc. The RA number or any other inscriptions must not be written or printed on the product box or packaging. We will not process the return if any of these conditions are not followed. All our phones are brand new unless specified. Our phones come with all original accessories in original box. Our phones are international and might come with International (American or European) Charger. (Our phones do not work with CDMA carriers like Verizon, Sprint, Boost, or any other CDMA Network Carrier). We do not guarantee, imply or express warranties unless otherwise stated in the listing. Address cannot be changed at any time. Other: We have the right to cancel the order under the following circumstances. In case of a Pricing Error. This policy may be modified or changed without any further notice. New Huawei Mate 20 Lite L23 64GB (Factory Unlocked) GSM 6.3 International Model. NEW Huawei P20 Lite 32GB/4GB DualSim (FACTORY UNLOCKED) 5.8 Black, Blue, Pink. SOBEONLINE1 1370 Washington Ave Ste 302 Miami Beach FL 33139. 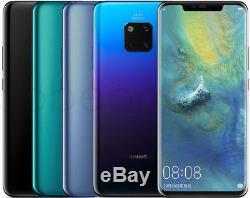 The item "Huawei Mate 20 Pro LYA-L29 128GB (FACTORY UNLOCKED) 6.39 Blue Gray Mocha Pink" is in sale since Friday, October 26, 2018. This item is in the category "Cell Phones & Accessories\Cell Phones & Smartphones". The seller is "sobeonline1" and is located in Miami Beach, Florida.